International G.I. Joe Collectors' Convention - GIJoeCon 2013! Click thumbnail images to see a full preview of each item in the box set! This will be one of Joe's most dangerous missions as he is going in solo. He will have to use his brains and charm to pull off this charade! The mission? Infiltrate Dragon Island, the clandestine headquarters of the infamous Black Dragon empire and home office of Terron Industries. He is there to determine how far along Black Dragon's research has come with their goal of creating world dominating monsters. They want to be able to turn any living creature into a monster that will do their bidding. The perfect opportunity has arisen as the billionaire recluse CEO of Terron Industries Sebastian Gorman, has invited socialites from around the world to his island as he is launching a new world hunger initiative. He claims that he can eliminate hunger through the use of a single pill (nutritionally complete) that can be inexpensively manufactured and distributed anywhere in the world. The AT believes that this hunger eliminator is the mechanism Black Dragon plans to use to selectively distribute their monster creation formula to terrorize the world population. Joe will parachute in from the team's stealth aircraft wearing his infiltration coveralls and his tuxedo so that he can blend into the party. After his "inspection", he plans to leave aboard the chartered ship that the invited guests/dignitaries used to arrive at the island. What will he find at the party? This is no ordinary Spy Island mission and it cannot end with any explosions as it could release the formula into the ocean and atmosphere. Joe will have to use his brains, wit and stealth to make this mission successful! Included in this 12" two figure set: Super Articulated G.I. Joe; Stealth Jumpsuit, Jump Helmet; Jump Goggles; Jump Boots; Parachute and Pack; Tuxedo Jacket, Tuxedo Pants; Dress Shirt; Bow Tie and Cummerbund; Dress Shoes; Disguise; Chemical Vial and Pistol. Super Articulated Villain; Nehru Jacket; Dress Pants; Nehru Shirt; Dress Shoes; Chemical Suit; Belt; Chemical Boots, 2 Chemical Suit Hoods; 2 Pairs of Chemical Gloves; and Laser Rifle. G.I. 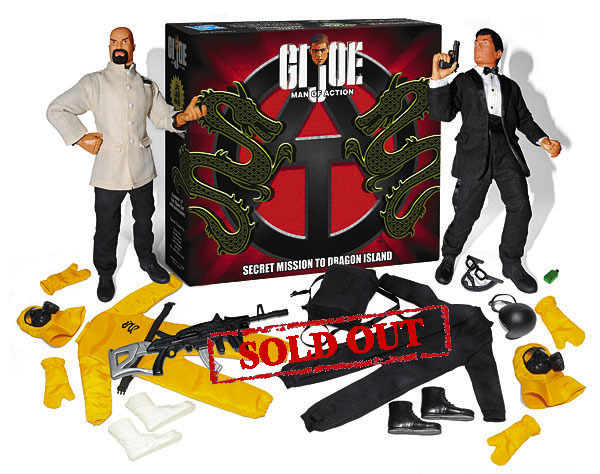 Joe Collectors' Club & GIJoeCon copyright © 2013, Fun Publications, Inc. All rights reserved.